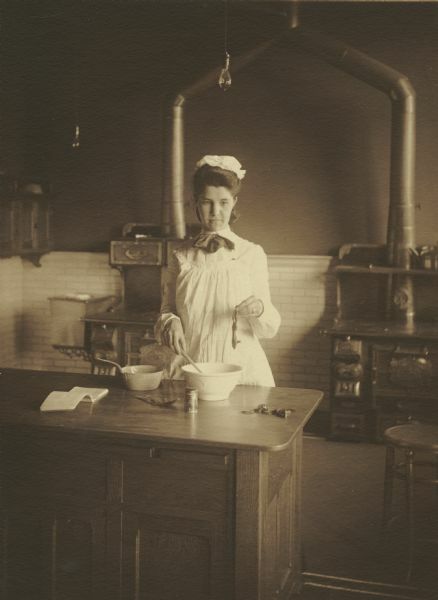 Bertha L. Retelsdorf, member of the Menomonie High School class of 1905, depicted as a cook . Part of a yearbook created by classmate Albert Hansen, based on a class prophecy theme. Page 50 of 70. Prophecy on page 49 reads, "The Queen of Madagascar has secured at an enormous cost and trouble the services of Birdie Retelstorf as chief cook for the royal family, where she serves such delicious dishes that the Queen would not part with her for love nor money. Recommendations can be received at any time from her majesty for any graduate from The Stout Manual Training School. Miss Retelstorf's master piece in the culinary line is a toothsome dainty known as Missionary Salad."